For any online guitar tuner microphone access is a requirement. You must have got a small browser popup asking for microphone access. 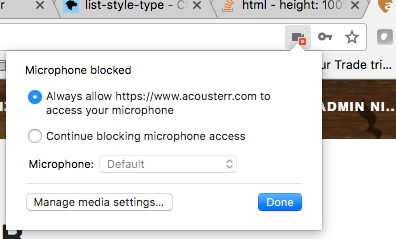 In case you accidentally blocked access for acousterr.com, you can go to right hand side of address bar in google chrome and you ll find an option to always allow microphone access to acousterr.com. You can google similar steps for other browsers as well. Refresh your page after unblocking microphone. Which all instruments and tunings can I tune using this tuner? Virtually any !!! We have standard tunings for some of the popular instruments apart from guitar like bass guitar (4/5 string), ukulele and mandolin. You can choose customized tunings by selecting the notes in the dropdown. Many advanced guitarists frequently use tunings like drop-D which can be easily tuned using this guitar tuner. It can be used as an online bass tuner microphone as well as a uke/mandolin tuner. Well now that your instrument is tuned you can browse one of the many available tabs for your favorite songs and play and follow them along.